Part 1 The wonder of the earth fills my soul. Ritual interactions with seasonal events are not to be missed. And so, every fall for many years I have made the annual pilgrimage to Jasper-Pulaski Fish and Wildlife Area, just north of Medaryville, Indiana off US421, to see the gathering of the sandhill cranes. Usually starting in October, they arrive in droves, enroute from their summer homes farther north in Canada, Michigan, and Wisconsin, to take a breather for a few days to a few weeks in northwestern Indiana before proceeding on to their winter homes in Georgia and Florida. The sight of thousands of these amazing birds flying in from all directions with their unique bugling cries, then landing, gabbling, dancing in Goose Meadow is an experience that is awesome in the truest sense. Cranes are magnificent creatures that must be seen–and heard–to be appreciated. I arrive at least an hour before sunset to see them glide in from the surrounding areas where they have been gleaning the marshlands and harvested fields. Cranes fly with necks and legs outstretched (differing from herons, who fly with their necks crooked in an “S”). Often a whole flock will hit a thermal and essentially stall, landing almost straight downward feet first with an elegant awkwardness. Usually on weekdays the crowds are smaller at the observation platform constructed on the east side of Goose Meadow; hearing the cranes is a vital part of the experience and sometimes it is difficult over the babble of idiots talking about the great bargains they found at Walmart (something I actually overheard). Why do people make the trip to see the cranes and then talk the whole time–is it just to say they did? They should stay home and watch YouTube videos. 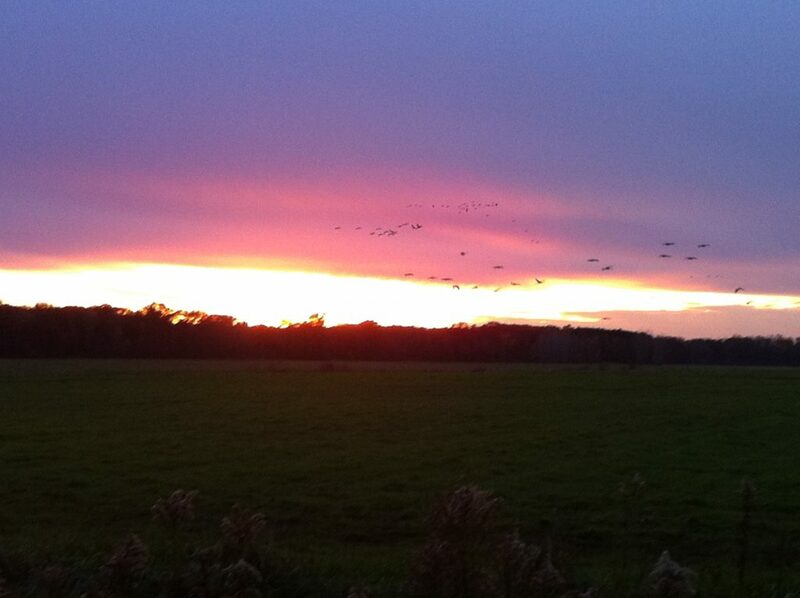 The rest of us want to revel in this glorious display and hear the crane music. No talking in church! I always stay until dark, nearly always the last to leave, alone with the cranes and the night. I’ve walked back to the car in moonlight, with bats darting overhead, my soul astir. Once, leaving the gabble and mutter of the meadow, I started down the road, and suddenly there was a huge rush and roar, and all the cranes rose at once to head out to their roosting areas. It was almost pitch black and I couldn’t see them, but I heard the magnificent beat of the wings. I was in the very Presence. The glacial moraine of south central Wisconsin has held a place in my heart for decades. Years ago, I often escaped to its rolling terrain and granite outcroppings when I lived in Chicago. Since then, I’d passed nearby a time or two and thought of returning to the area, and finally, several years ago, I did. But as I was leaving Baraboo, heading back home, I discovered that the International Crane Foundation was nearby. How did I miss that? Darn! I had to go back. And I did, twice. 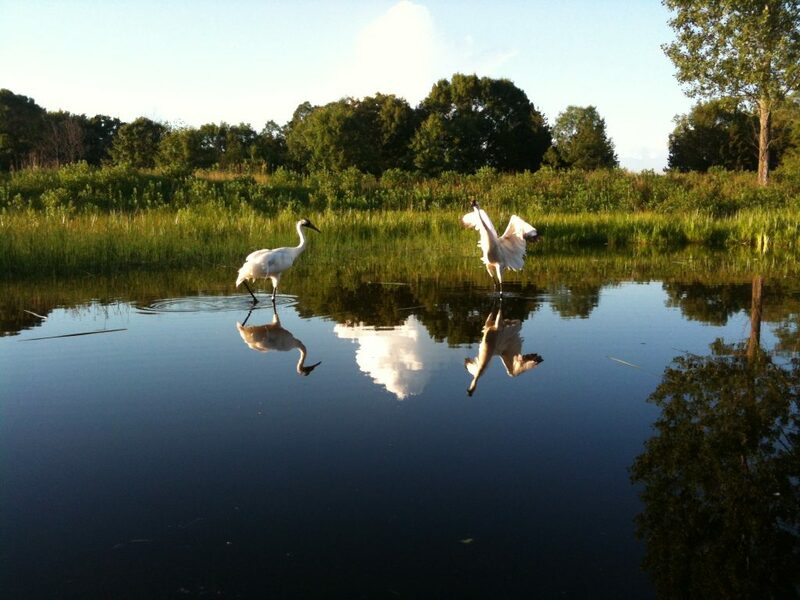 The International Crane Foundation (ICF)Home – International Crane Foundation was co-founded in 1973 by two pre-PhD ornithologists, George Archibald and the late Ron Sauey, fellow graduate students at Cornell. Both young men admired early environmentalist Aldo Leopold (whom I regard as a spiritual guide), and, as it turned out, Sauey’s family owned land just down the road from Leopold’s legendary Shack, featured in his masterpiece Sand County Almanac. The origins of today’s ICF began on that land, not very far from their present, larger property, which houses research facilities, a library, and mating pairs of all fifteen of the world’s cranes. Cranes were–and remain–greatly threatened, largely due to the disappearance or compromise of their various habitats. Dr. Archibald set out to raise cranes in captivity and release them in the wild and originated a number of techniques to prevent chicks from imprinting on their human helpers. Whooping cranes, a North American species, were nearing extinction and Archibald worked extensively with a female named Tex, mimicking mating calls and dances of the male. Tex finally did lay a fertile egg through artificial insemination, but tragically, she was killed by a pack of marauding raccoons shortly after successfully hatching her chick. 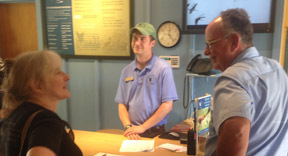 Dr. Archibald was director of the International Crane Foundation from its inception until 2000, and is still very much involved with the organization. Today he writes, lectures, and works with the International Union for Conservation of Nature (IUCN), heading the Species Survival Commission for cranes, traveling to crane habitats all over the world, including the Demilitarized Zone between North and South Korea. 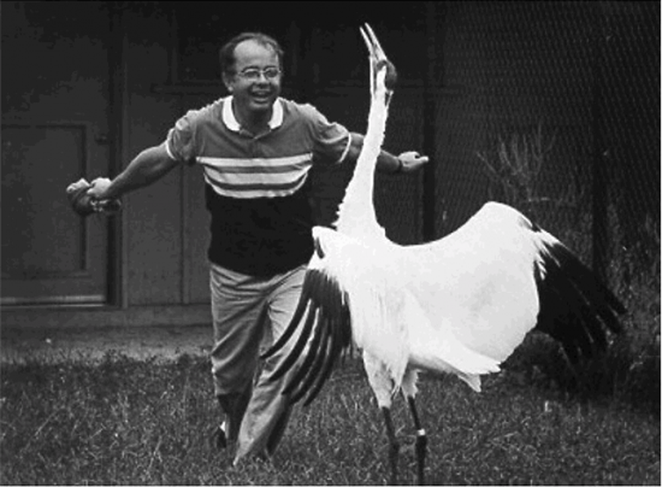 In 1984, relatively early in his career, Dr. Archibald won a coveted MacArthur “genius” award, and in 2006 he won the inaugural Indianapolis Prize for his life-long dedication to crane conservation, to name but a few of the many honors he has received. What better way to celebrate summer solstice than with the glorious cranes? The International Crane Foundation hosts a fundraiser every summer called “An Evening with the Cranes.” Local restaurants set up stations of good things to eat and drink throughout the public part of the facility, along the paths that wind past the pens of the cranes. The sun was bright and hot at 5pm, here deep in the Central Time Zone (as Indiana is supposed to be). The ICF public area is nestled amidst a restored tall-grass prairie, so shade was at a premium, but never mind, it was all about the cranes. There was the gorgeous pair of whoopers, which I could watch for hours. And then there was this stately Sarus crane, a huge bird some six feet tall (I had to look up at him!) and over 50 years old! Majnu had lost his lifelong mate a year or two before and had not been doing well. Then he was introduced to a sweet young thing, and in due course came chicks. He’s doing fine. Many of my most revered environmentalists are long gone: John Muir, Aldo Leopold, Rachel Carson. Dr. George Archibald, happily, is very much still with us, still dedicated to his life’s mission of saving cranes. And there he was, amiably chatting with various “craniacs.” To me, he’s a rock star! I summoned the courage–hardly necessary–to go up to talk with him, sharing a little about my work. He graciously introduced me to the current director of ICF, even as more people clamored to chat. I was elated. But two days later, leaving Wisconsin, I wanted to stop in briefly at ICF once more, perhaps to hear the cacophony of cranes and look in the shop–and there he was, as gracious as before. We talked of cranes and wonder. This entry was posted in Encounters with Wildlife, The Wonder of It All and tagged cranes, George Archibald, International Crane Foundation, Jasper-Pulaski FWA, nature, Wisconsin. Bookmark the permalink.